← We’re Building a Playground! To talk to Gloria and Alfred Rodriguez is to travel through the history of Lavaca. They’ve lived in their pink house on Eager St since 1999, but their connection to this community goes way back. Gloria’s father, Dionicio Soberon, the youngest of seven children, moved with his family to Devine St in the 1920s. After serving in WWII, he returned to Lavaca with his wife, Josefina. Gloria with her sister Gracie in 1956, on the steps of Fredo and Gloria’s Eager St. home. 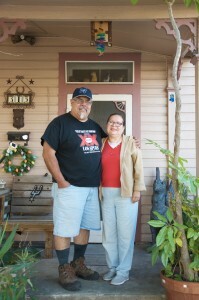 A mechanic and a homemaker, Gloria’s parents built their 1200 SF home on a small lot across from his childhood home. Divided in two, the Soberon family of four lived on one side, while they rented out the other side. Each unit had a kitchen, but one bathroom was shared by all. Gloria was born there in 1952 and has spent most of her life in Lavaca. Alfred, better known as “Fredo,” was born in Victoria Courts in 1955, but his family moved to the Westside when he was small. In the 1960s, he and his friends rode their bikes from the Westside to downtown, but jokes “We never went across into Lavaca.“ His return would come in the 1980s. A 1 yr old Gloria with her neighbor and life long friend, Raul Solitaire, in front of her father’s family home on Devine St.
Gloria attended St. Mary’s School and Providence High School in the 1950s and 60s. Growing up in Lavaca, Gloria often played with her best friends, Barbara, Margaret, and Margie, who lived on Sadie St. “We didn’t have any fences, all the kids ran through the back yards, visiting each other’s houses, playing in the street and we’d walk to the Handy Andy,” she said. Lavaca was her family: two of her aunts lived in the family house on Devine St with her grandmother, one aunt lived on Presa St near La Villita, and another aunt lived on Sadie St.
She moved to Delaware St in the 1970s when she married. Then for a few years she moved to the Southside, but came back to Lavaca in the late 70s. A house on the corner of Leigh and Eager belonged to old friends of Gloria’s mother. They’d kept it in perfect condition but could no longer live on their own. When they offered it to Gloria for $15,000 she didn’t hesitate. She bought it unseen, for $5000 down and $100 per month. She eventually divorced, but lived on in Lavaca, continuing her job as bookkeeper for Levi Strauss Manufacturing and later the Guenther Hotel until her retirement. Fredo moved to Lavaca in 1986 to help care for his parents, living on another corner of Leigh and Eager. Lavaca was a different place in the 1980s than the Lavaca of Gloria’s childhood, and the two neighbors hadn’t spoken much beyond a simple nod. On September 22, 1989, while enjoying the jazz festival at Travis Park, Fredo spotted his neighbor, Gloria. He said “Hey Neighbor!” And they’ve been together ever since. For the past 23 years, Fredo has driven an 18-wheeler for Berlin Packaging. Both active in their parish, Immaculate Heart of Mary, they are members of the Knights of Columbus and the Men’s and Women’s Clubs. A 1974 graduate of Lanier High School, Fredo and his classmates raise funds every year for $1000 scholarships given to seven “B” students. “They’re the ones who need our help,” said Fredo. After Gloria’s mom died in 1998, they moved back into her childhood home on Eager St. All six of Fredo’s younger siblings have passed away, and now he is somewhat of the patriarch of their large extended family. With 29 nieces and nephews and 28 great nieces and nephews between them, the little house on Eager St is often filled with children and food and family fun.